Web Intelligence and Crystal Reports are most common BI tools that are used for reporting. WebI uses a semantic layer called Universe to connect to data source and these Universes are used for reporting in tool. These Universes are designed with the help of Universe design tool UDT or with Information Design tool IDT. IDT supports multisource enabled data source. However, UDT only supports Single source. Main tools that are used for designing interactive dashboards- Design Studio and Dashboard Designer. Design Studio is future tool for designing dashboard, which consumes HANA views via BI consumer Service BICS connection. Dashboard design (xcelsius) uses IDT to consume schemas in HANA database with a Relational or OLAP connection. SAP Lumira has an inbuilt feature of directly connecting or loading data from HANA database. HANA views can be directly consumed in Lumira for visualization and creating stories. Office Analysis uses an OLAP connection to connect to HANA Information views. This OLAP connection can be created in CMC or IDT. 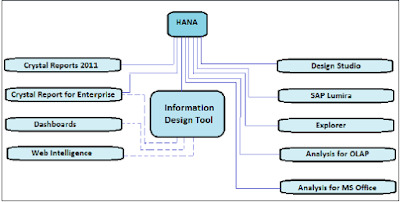 In the picture given above, it shows all BI tools with solid lines, which can be directly connected and integrated with SAP HANA using an OLAP connection. 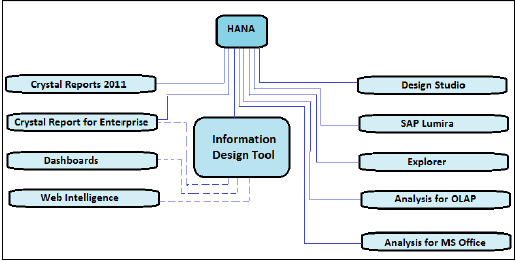 It also depicts tools, which need a relational connection using IDT to connect to HANA are shown with dotted lines. The idea is basically if you need to access data from a table or a conventional database then your connection should be a relational connection but if your source is an application and data is stored in cube (multidimensional like Info cubes, Information models) then you would use an OLAP connection. A Relational connection can only be created in IDT/UDT. An OLAP can be created in both IDT and CMC. In Information design tool (IDT), you can create a relational connection to an SAP HANA view or table using JDBC or ODBC drivers and build a Universe using this connection to provide access to client tools like Dashboards and Web Intelligence as shown in above picture. You can create a direct connection to SAP HANA using JDBC or ODBC drivers.